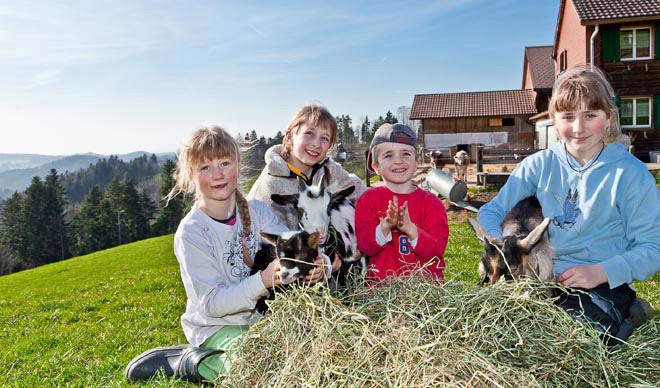 Plenty of farm life to enjoy at a unique spot with lake and mountain view: Jucker Farm in Seegräben (ZH). For day trips, farm shopping, festive events and seminars. A ProSpecieRara show farm for endangered farm animal breeds in an idyllic setting above Ermenswil located directly at the hiking trail. The nicely decorated rooms are perfect for weddings, birthday celebrations, family gatherings and company events of 40 to 100 people. Enjoy fresh vegetables and fruit according to the season at Berger's farm shop. Choose from 37 apple varieties, cherries, nectarines, plums, prunes and sour cherries. Our rebuilt cowshed with 56 seats and 40 seats on the treshing floor as well as a large garden terrace are directly located at the popular bike and inline route around the Greifensee. Experience catering in a family atmosphere and relax surrounded by the clanging of cow bells at our snug garden restaurant. A local recreational area far from traffic and fog with a breathtaking panoramic view of Lake Zurich, the Linth area and the Alpstein chain at 1145 meter above sea level.